Make a black skater dress and a Miu Miu small grace calfskin shoulder bag from Nordstrom your outfit choice to get a laid-back yet stylish look. Take a classic approach with the footwear and throw in a pair of white and black leather ballerina shoes. If you're all about being comfortable when it comes to planning an outfit, this combination of a mint coat and a Miu Miu small grace calfskin shoulder bag is just for you. Gold leather heeled sandals will instantly smarten up even the laziest of looks. If you're obsessed with relaxed dressing when it comes to fashion, you'll love this chic pairing of a white and black cable sweater and a black and white leather clutch. Sporting a pair of black leather ankle boots is an easy way to add some flair to your ensemble. If you're obsessed with relaxed dressing when it comes to your personal style, you'll love this extra adorable pairing of a beige shawl cardigan and a Miu Miu small grace calfskin shoulder bag from Nordstrom. And if you want to instantly up the style ante of your look with one piece, enter black suede wedge ankle boots into the equation. Reach for a green maxi dress and a Miu Miu small grace calfskin shoulder bag for a lazy day look. When it comes to footwear, this look is finished off well with gold leather thong sandals. 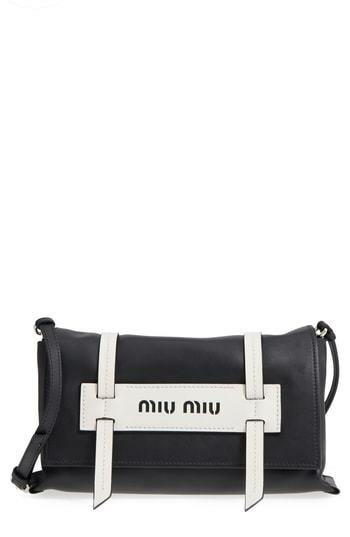 If you're all about relaxed dressing when it comes to fashion, you'll love this stylish combination of a black leather bomber jacket and a Miu Miu small grace calfskin shoulder bag. You could perhaps get a little creative when it comes to footwear and elevate your getup with white leather pumps. Opt for comfort in a white coat and a black and white leather clutch. Wearing a pair of black leather heeled sandals is a simple way to add extra flair to your look. If you want to look cool and remain cosy, marry a white fringe midi dress with a Miu Miu small grace calfskin shoulder bag from Nordstrom. Sporting a pair of white and black leather heeled sandals is an easy way to add extra flair to your getup. If you're obsessed with relaxed dressing when it comes to fashion, you'll love this totally stylish pairing of a beige leopard fur coat and a Miu Miu small grace calfskin shoulder bag. Make black leather pumps your footwear choice to take things up a notch.